Amazon Lex provides an easy-to-use console to guide you through the process of creating your own chatbot in minutes, building conversational interfaces into your applications. You supply just a few example phrases and Amazon Lex builds a complete natural language model through which your user can interact using voice and text, to ask questions, get answers, and complete sophisticated tasks. With Amazon Lex, you can build, test, and deploy your chatbots directly from the Amazon Lex console. Amazon Lex enables you to easily publish your voice or text chatbots to mobile devices, web apps, and chat services such as Facebook Messenger, Slack, and Twilio SMS. Once published, your Amazon Lex bot processes voice or text input in conversation with your end-users. Amazon Lex is a fully managed service so as your user engagement increases, you don’t need to worry about provisioning hardware and managing infrastructure to power your bot experience. 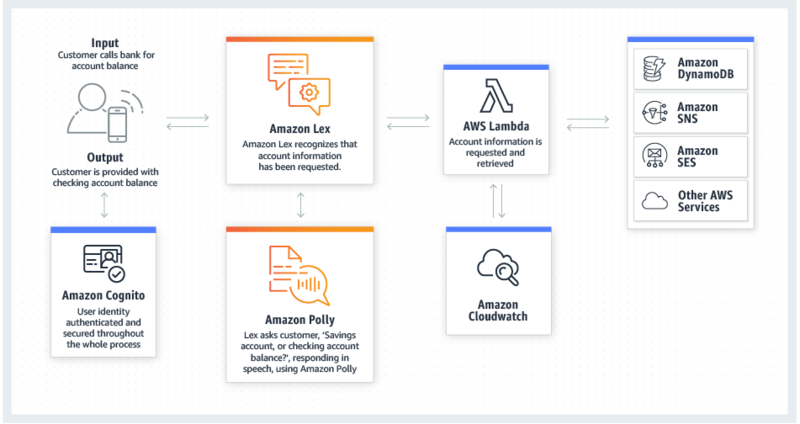 Amazon Lex provides built-in integration with AWS Lambda, AWS MobileHub and Amazon CloudWatch and you can easily integrate with many other services on the AWS platform including Amazon Cognito, and Amazon DynamoDB. You can take advantage of the power of the AWS platform for security, monitoring, user authentication, business logic, storage and mobile app development. With Amazon Lex, there are no upfront costs or minimum fees. You are only charged for the text or speech requests that are made. Amazon Lex’ pay-as-you-go pricing and low cost per request make it a cost-effective way to build conversational interfaces anywhere. With the Amazon Lex free tier, you can easily try Amazon Lex without any initial investment. By using an Amazon Lex chatbot in your Amazon Connect call center, callers can perform tasks such as changing a password, requesting a balance on an account, or scheduling an appointment, without needing to speak to an agent. These chatbots use automatic speech recognition and natural language understanding to recognize the intent of the caller. They are able to recognize human speech at an optimal (8 kHz) telephony audio sampling rate, and understand the caller’s intent without requiring the caller to speak in specific phrases. Amazon Lex uses AWS Lambda functions to query your business applications, provide information back to callers, and make updates as requested. Amazon Lex chatbots also maintain context and manage the dialogue, dynamically adjusting responses based on the conversation. With Amazon Lex, you can build highly interactive and conversational user experiences for connected devices in the rapidly growing segment of Internet of Things (IoT). This creates opportunities for entirely new categories of conversational products in a variety of markets – from cars and devices, to wearables and appliances.